For a short-lived 10 minutes, things looked a little iffy for Utah State. The Aggies opened up the game with a lightly-contested drive, only to stall in the redzone. Then, the usually sure-legged Dominik Eberle missed a short field goal, and UNLV responded with a touchdown drive to take a 7-0 lead over the Aggies. 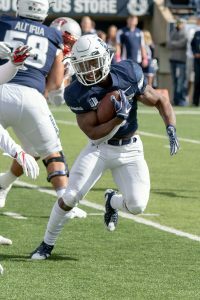 Utah State poured on 42-straight unanswered points over the remainder of the first half, dominating in all three phases of the game on their way to a 59-28 Homecoming win over UNLV. It happened rapidly, too; Utah State reeled off 35 of those 42 points in only 8:50. The victory gave Utah State (5-1 overall, 2-0 Mountain West) its best start since 1978. The Aggie touchdown barrage started with a 24-yard scoring pass over the top of the Rebels’ defense from Jordan Love to Jordan Nathan. On the next possession, the Aggies scored on a free play. UNLV (2-4, 0-2) was flagged for an offsides, and Love hit a wide-open Jalen Greene for an 80-yard touchdown down the sideline to make it 14-7. It was the Aggie defense’s turn to make a play next. Jontrell Rocquemore jumped a short out route and picked off UNLV quarterback Max Gilliam. Two plays later, Love connected with Savon Scarver from 26-yards out. Special teams came up with the next big play. Logan Lee sacked Gilliam, and UNLV lined up to punt. USU freshman Deven Thompkins got a fantastic jump on the snap. He nearly beat the ball in a race to UNLV’s punter, and Thompkins blocked the kick with ease. Baron Gajkowski scooped up the loose ball and ran it back from 16 yards out to make it 28-7. Darwin Thompson punched in a seven-yard rushing touchdown to give the Aggies their fifth touchdown in less than nine minutes. Thompson ran for 52 yards on the day, and Gerold Bright contributed a team-high 72 yards. David Woodward was a force of chaos for the Aggies. Woodward recorded 3 sacks and 12 tackles, including 3.5 tackles-for-loss. The Aggies were in Gilliam’s grill all game long; Woodward, Fua Leilua, Shaq Bond, Suli Tamaivena, Tipa Galeai, Jacoby Wildman and Lee all combined for a total of seven sacks. Utah State finished with 11 total tackles-for-loss. It was an afternoon-to-remember for Love. The sophomore quarterback went 17 of 23 for 322 yards and a career-high five touchdowns. Love’s five scoring strikes tied a school record. 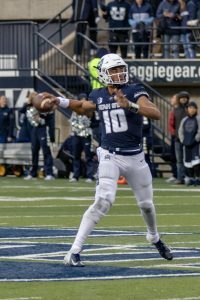 It was a feat that has been accomplished nine times in USU history; the last signal caller to reach that milestone was Chuckie Keeton in 2013. The Aggie receiving corps was phenomenal. Jalen Greene led the way with five catches for 132 yards and a score. 12 different receivers caught passes from Love. Ronquavion Tarver snared four passes for 52 yards and a pair of touchdowns. Savon Scarver and Aaren Vaughans teamed up in the slot position to combine for 107 yards on four receptions. The second half featured plenty of playing time for third-string and fourth-string Aggies on both sides of the ball. 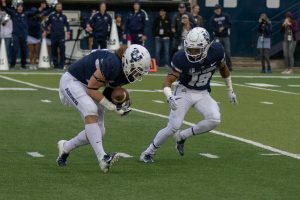 USU backup quarterback Henry Colombi scored his first career touchdown late in the game on a 37-yard keeper. The Aggies will now prepare for a road matchup with Wyoming. The Cowboys have beaten USU in their last two meetings.